Climate change is upon us, and adapting ourselves to the situation is the only way we can sustain our way of life. In recent years, governments and businesses around the world have implemented environmentally aware practices to lessen the negative impact of human activity on the climate. Some, however, say that while they believe in going green, it’s just too expensive or takes too much effort. But, as the adage goes, when there’s a will, there’s a way. 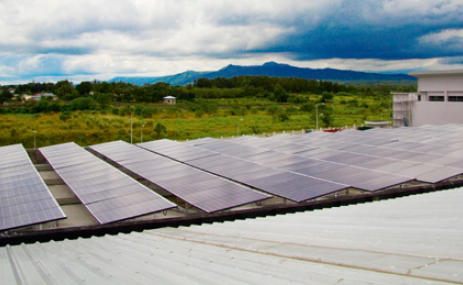 Two Filipino businesses, Greenovate Corp. and First Philec Solar Solutions (FPSS), prove that dealing with climate change is not only socially responsible, but can also be a solid, profitable business. The secret to their success? A marriage between harnessing the benefits of up-to-date technology and giving consumers sustainable solutions. The best place to start making a difference is where a family’s heart is: the home. It’s a demand that Greenovate understands and meets. The company is Cebu’s top supplier of Earth-friendly construction materials that are made of renewable and recycled elements. They’re also designed to meet building standards for both commercial and residential structures. A Green Home abode is intended for assembly on pre-existing lots. 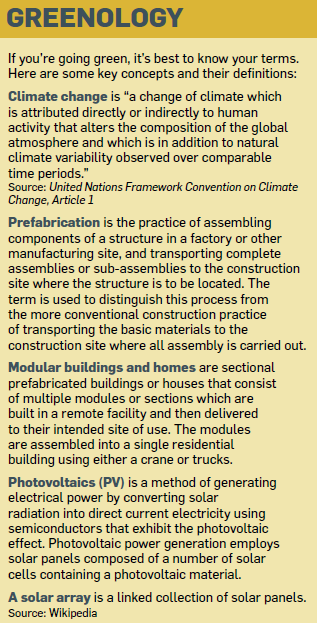 In addition, since the company uses modular designs that allow for construction at workshops off-site, it saves on time and minimizes the environmental impact at the build site. Another advantage of having this type of dwelling is its Earth-conscious practicality. Each unit is equipped with solar-powered heating and air-conditioning capabilities. Residents can also manage their water supply via a system that allows them to store and recycle rainwater. And while the company uses prefabricated materials, the result isn’t dull, character-less housing. Each Green Home project is tailored to fit a client’s preferences and budget, turning the hard lines and strong angles typical of modular construction into organic canvases of environmentally sound living without breaking the bank. 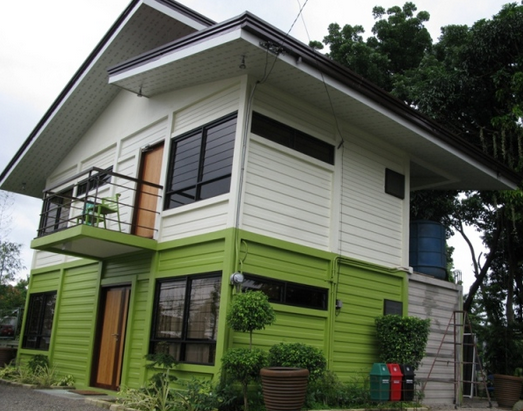 Since its deployment in the Visayas and Mindanao regions, Green Home has seen very promising initial success. By the end of 2011, it had successfully closed deals for four houses, with 10 more prospects set for completion in January 2012. It is also set to build 16 duplexes and 16 bungalows in Cebu. Their operations aren’t limited to Cebu, either: a model house unit is being built in Ozamis City, Misamis Occidental, for a 60-unit subdivision development in the area. Furthermore, the rise of Green Home has encouraged other developers in the region to consider Greenovate’s services and materials for their own projects. Solar power is virtually inexhaustible, and its applications are limited only by the technology designed to harness it. With today’s science, along with the vision and initiative of entities like First Philippine Electric Corp., the dream to harness the sun’s power is steadily materializing—hopefully in time to aid a world plagued by energy woes. 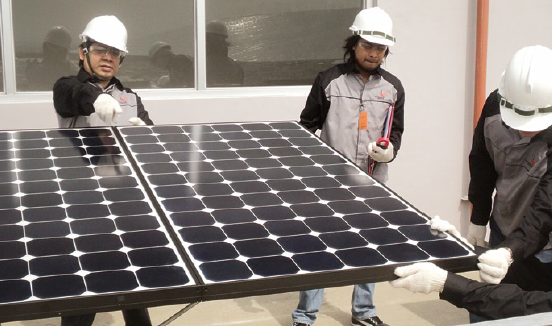 Created in mid-2009, First Philec Solar Solutions (FPSS) is a subsidiary of First Philec, which in turn is a part of the Lopez Group of Companies. The core purpose of FPSS is to take the boundless energy of the Sun and find ways to make it a viable source of alternative energy, whether tied to existing electrical grids or off-grid. It is essentially a systems installation company, deploying solar arrays and similar technology in commercial, residential and industrial settings. The solar arrays are photovoltaic (PV) systems, providing clean and renewable energy with zero environmental impact, both in terms of installation and implementation. With clients and partners like the College of Engineering of the University of the Philippines and entities within the Philippine Economic Zone Authority, it has implemented a variety of solar arrays that serve simultaneously as energy sources for their locales and as research venues for additional data. A school on a remote mountain in Nueva Vizcaya has FPSS to thank for its electricity, for example. What FPSS learns from each installation, it incorporates into its main framework so that solar tech in the Philippines can be developed even further. This is cutting-edge technology at work, and of course, it comes at a price. “With regards to the cost, the solar panels and equipment are expensive compared to other renewable and conventional sources of energy,” explains Dr. Danilo Lachica, president of FPSS. However, “solar power plants and installations require minimal maintenance, have no fuel costs, and have a lifespan that is guaranteed for at least 25 years. Also, recent developments have caused a dramatic decrease in prices of PV components, which moves the cost of solar energy closer to grid parity.” In short, solar energy may cost more initially to implement, but it’s cost-effective and eco-friendly over the long term— a significantly more worthwhile investment compared to traditional energy sources. Admittedly, initiatives like Green Home and FPSS still have to find a bigger audience. But when it comes to shaping the future, it’s better to be leading the charge than to catch up with the rest. This article was originally published in the March 2012 issue of Entrepreneur magazine (with updates from the editor). Subscribe to the print or digital version here.